Welcome to May’s Our-happy-cat.com newsletter. Well Spring is starting to spring and Little Mo is venturing outside more, even if her old bones are not quite as agile as they once were. I hope the sunny is coming out for all your cats too where ever you are. As usual I have been busy with adding new content to the website and have been contacted by a lot of you to tell me how much you are enjoying the site. I am so please as it is not easy competing with the big boys in the cat industry, I try to keep the site friendly and designed with you in mind. Enjoy this months Ezine and don’t forget to enter our monthly caption competition for a chance to win a great prize. Next month I am hoping to feature an original cat story sent in by one of the visitors to our website. It looks like it will be a very unusual and interesting read. Last month I asked you what you would think of a mini myspace area for your cat on our website. I received many replies of interest and so I went ahead and changed our cats gallery area to incorporate this new addition. I have separated the CAT OF THE WEEK to its own area to make it more visible and have moved the CAT GALLERY to a more prominent position too. Now once someone submits their cats picture to the gallery they are offered their own CAT HUT (that is the name we have given to the new mini myspace areas. All the new Cat Huts are highlighted with a star next to their picture. Now cat owners can add their own pages and pictures to their own Cat Hut and comments on each others submissions. 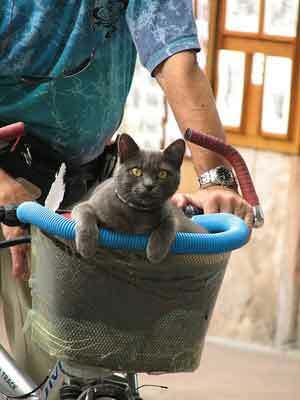 Creating as great place to meet other cats and their owners. I hope the Cat Huts will go from strength to strength. Also this month I have added a PODCAST to the site from the Blue Cross Animal Charity. Now you can listen to all their news from the animal world and hear interesting animal stories etc. Simply Scroll through to the story that interest you and click on the headphone symbol to listen. Don’t forget if you have any cat news or event in your area that you would like to promote simply fill in the form on the cat news page and we will add your submission for free. Here is May's Caption Competition. You are the first to see it as it doesn't get posted onto the site for a few days, so it gives you extra time to get your entries in first. The deadline for this competition is May 20th. The best caption will be chosen and the winners name and caption will be posted on the www.our-happy-cat.com competition page. 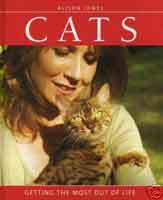 This month the prize is a copy of the book Cats – Getting The Most Out Of Life. By Alison Jones. Chirp Chirp purrrrrrr Yes I'm happy today. I have overcome my fear of enclosed spaces. My mum and dad have bought me a shiny new litter tray, it is pink and cream and has a top on it, so it is like a little room. Now years ago I had another one of these but I was too scared to get into as, I thought that it looked to much like the cat carrier and I thought they were going to take me to the vets again. So for years now I have used a un-covered litter tray. Luckily I didn't need to use it that often, as I would go outside but now, as I am getting a little older, I go out less and so need indoor facilities. The problem was my mum and dad would get very fed up with me covering the kitchen in cat litter all the time, so they have bought me this new super doper litter tray. And I love it and am not scared of it at all now. I can tell my mum and dad are so proud of me as they keep patting me every time I use it. I would thoroughly recommend these covered litter trays to my furry friends out there; it really is great to have your very own private little room.